100 meter CNC machine « Adafruit Industries – Makers, hackers, artists, designers and engineers! Over 100 metres reach lets CNC machine. A large and precise 5-axis CNC machine is available for cutting positive and negative molds for large turbine blades. The robot or gantry, called HSM-Modal, comes from EEW Maschinenbau in Germany. 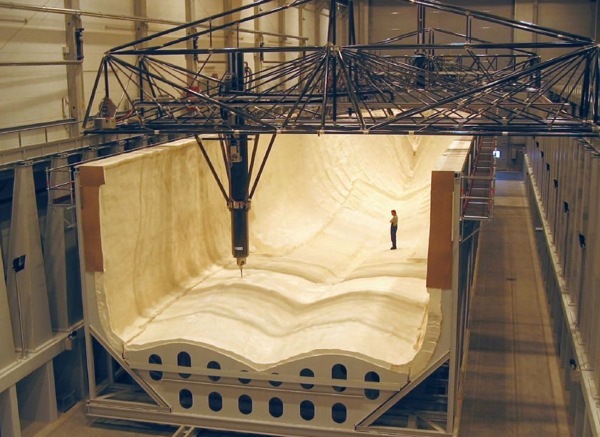 It can mill 1:1 scale negative and positive molds for rotor blades that are 50 m and more, and in one single piece. The X-axis the on machine can span 151 metres. The machine also trims blades, and soon, it will lay glass-fiber mates into negative molds. Hey look, it can even mill out a little human figure!